Later today, Lionsgate will present two of its most highly-anticipated movies, Power Rangers (March 24, 2017) and John Wick Chapter 2 (February 10, 2017) in one action-packed panel. The first trailer for John Wick Chapter 2 will debut during this New York Comic Con panel, but while we wait for the footage to arrive, a brand new NYCC poster shows Keanu Reeves' title character in quite a bind. This bloody assassin finds himself completely surrounded, with several guns pointed right at his face, but, given John's skill set, we wouldn't bet against him surviving. Earlier this week, Lionsgate released a brief trailer preview, showing Keanu Reeves visiting a tailor in Rome, getting measured for a new suit. The tailor asks him if this suit is for a "formal event or a social affair," with John revealing it's a social affair. Instead of cocktails and witty banter, John Wick's idea of a "social affair" involves being perched on a rooftop, taking out his enemies with a high-powered rifle. We'll surely see more of this massive gunfight when the first trailer arrives from NYCC later today, but for now, this NYCC poster from Empire will have to suffice for now. John Wick 2 follows Keanu Reeves' title character, who is forced out of retirement by a former associate plotting to seize control of a shadowy international assassins' guild. Bound by a blood oath to help him, John travels to Rome where he squares off against some of the world's deadliest killers. Director Chad Stahelski teased in a recent interview that this sequel will expand on the world John Wick inhabits, teasing fans would learn more about the Continental Hotel and the assassins who inhabit it. Chad Stahelski is directing the sequel by himself, after helming the original with David Leitch, with the pair temporarily splitting up as David Leitch went on to direct The Coldest City starring Charlize Theron, a project they at one point both intended on directing together. Instead, the filmmakers decided to divide and conquer, with Stahelski taking John Wick 2 and Leitch taking The Coldest City. John Wick 2 will also bring back Ian McShane as Winston, Lance Reddick as Charon, Bridget Moynahan as John's late wife Helen and Thomas Sadoski as Jimmy. Among the new cast members are Common, Ruby Rose, Peter Stormare and Laurence Fishburne, who worked with both Keanu Reeves and Chad Stahelski on The Matrix trilogy, which Stahelski worked on as a stuntman and stunt coordinator. Laurence Fishburne is playing a character called The Bowery King, who we hopefully get to see in the first full trailer from NYCC today. Lionsgate also recently released a photo from this sequel that shows John Wick walking his new dog across the Brooklyn Bridge, the same pooch he picked up at the very end of the first movie. 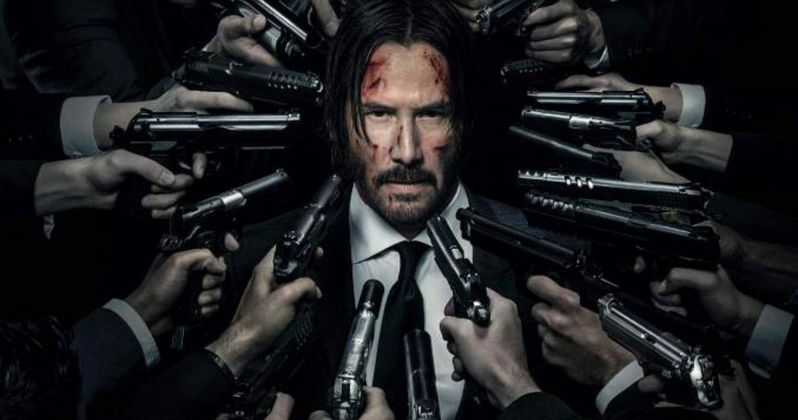 The original John Wick wasn't a box office juggernaut, earning just $43 million domestically and $86 million worldwide from a $20 million budget, but it became an instant cult classic with the fans. John Wick: Chapter 2 may even have a more difficult road ahead at the box office, going up against Fifty Shades Darker and The LEGO Batman Movie on February 10, 2017. Take a look at this new poster, and check back later today for the first trailer.